Larger sets made a huge impact during the first quarter of this month, making up more of the market than ever before. Back in the first quarter of 2010 the television market was dominated by sales of sets between 40 and 49 inches, while sets 50 inches or larger sat at a 20 percent market share. In the following quarters, large sets fell down to as low as 18.7 percent, but that's changed significantly for the beginning of this year. In the first quarter of 2011, 50 inch sets accounted for 22.7 percent of sales - a new record. Smaller sets took a dip across the board, except for those between 30 and 39 inches, which also rose. Analyst Riddhi Patel of iSuppli says that the primary reason for the change is the price. 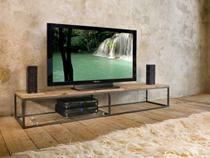 "The rising popularity of 50-inch-and-larger sets among U.S. consumers stems from pure market economics," says Riddhi. "Televisions have become less expensive for the consumer, allowing even bigger sets previously considered beyond the reach of most consumers to become accessible."